Shortly after 9 a.m. on a recent Monday morning, Shawn Jensen and two other rail maintainers got off a light-rail train at the METRO Blue Line’s Target Field Station and began slowly walking south. Stepping down the line through downtown Minneapolis, the neon-vested trio looked up, down and around the track looking for anything out of the ordinary. After nearly three hours of methodic walking and observing, the three-man crew had made their way four miles south to 38th Street Station. Another group would later complete the trek, walking from 38th Street to Mall of America Station in Bloomington. The goal: notice any changes or anomalies and address the issue quickly as a form of preventative maintenance. Besides checking the condition of rails and the fasteners that hold them to the ground, maintainers look for debris in the tracks, slight changes in track alignment and check lubricator boxes to ensure they’re working properly. With turnouts that allow trains to switch sides of the track, maintainers look to make sure the switch points are perfectly flush to the stock rail so light-rail vehicle wheels don’t "pick the point" -- an industry way of saying get caught. Maintainers also keep an eye on the Blue Line's aesthetics, picking up trash and noting places where graffiti and overgrown vegetation needs to be removed as they move up-and-down the line. Such up-close inspections – called “track walking” by those who do it – are not unusual. In fact, maintainers like Jensen walk the entire length of the 11-mile METRO Blue Line twice a week. 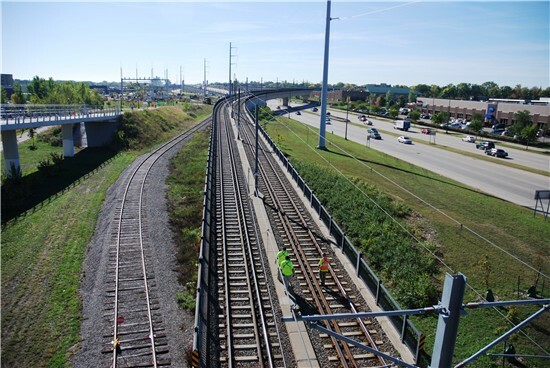 The same inspections will happen on the METRO Green Line after it opens next year. Pausing only for heavy snow or rain when visual inspections are conducted from the train’s cab, the federally-mandated walking inspections occur on a year round basis. A group of 13 maintainers and foreman, many with backgrounds in the freight rail industry, perform the walking inspections. All are based at Metro Transit's Light Rail Support Facility. Rail tracks also go through an ultrasonic inspection every year using a machine that digitally detects internal defects that can't be spotted with the naked eye. Light-rail operators routinely report their observations about track conditions as well. Even so, track maintenance staff says there’s no replacement for the kind of routine, detailed inspections that come from the weekly walks. Manually performing the inspections is also less obtrusive because trains continue to operate in service while they occur. With three people assigned to the job, a designated lookout watches for trains and makes sure walkers are safely out of the way as the trains pass. Minor issues that are identified can be remedied in less than a day while other observations lead to longer-term fixes that unfold over time. Such diligence has paid off, too. Since the Blue Line opened a decade ago, there have been no performance issues attributed to poor maintenance -- something Jensen says he keeps in mind on his long walks. “I like doing this because it's good exercise but really we're here to make sure the line is in top condition for the safety of the people who are riding the system,” he said.